Hi all! I was able to get a couple hours of crafting in today. 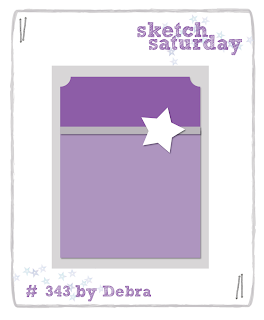 I wanted to do a simple card and thought this sketch from Sketch Saturday was just the perfect sketch to do that. I started with a purple card base (wild pansy to be exact). I cut a piece of purple plaid patterned paper and added it to the bottom of the card. To the top half I added a piece of light purple card stock that I embossed with a flower embossing folder from Cuttlebug and then I rounded the corners off using a corner punch from EK Success. I added a white ribbon across the center where the two papers meet. I layered a light purple paper daisy onto a slightly larger white paper daisy and then layered them onto a large purple paper daisy. I added a purple rhinestone in the very center and 3 more on the ribbon. Lovely spring colors with great embossing texture. Thanks for joining us at Sketch Saturday this week and we hope you will come back next week and show us more! Love the spring colors and I am so ready for it.. I love the C&S look it's very pretty. thanks for joining us at Catch the bug and hope you join us Saturday the 17th for our birthday bash we're turning 5. Love the shades of purple! Wonderful card! Thanks so much for playing along in my Monday Morning challenge!